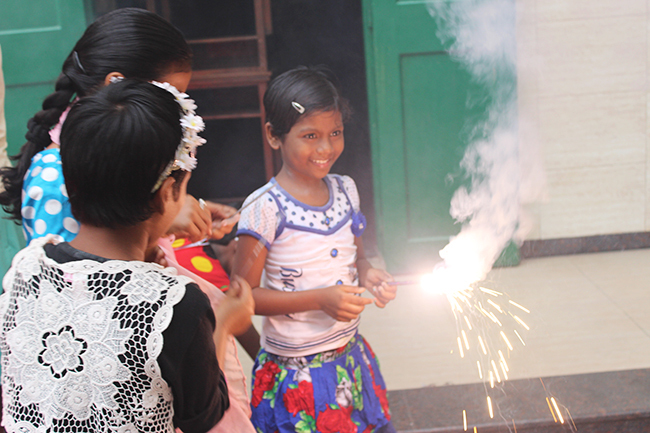 On the 16th of November, 2015, the LTS of Loreto Elliot Road had organized a Diwali Celebration for the Rainbow children of the school. The celebration started with a prayer service followed by a Dance then the lighting of the diyas by Madam Principal, Sisters, senior school coordinator, and the LTS animators. After which all the children started playing with fire crackers. Everybody enjoyed and got into the mood of Diwali with the enhancement of fire crackers and Diwali Sweets. It was an enjoyable evening spent with the Rainbow children as we all the LTS’ ers, non – LTS ers as well as the teachers enjoyed a lot. The Diwali Celebration was a successful event organized by the LTS’ ers, and the LTS animators. On the 9th of November, 2015 the members of the leadership training service (LTS) took part in the Swacch Bharat abhian. This was an initiative taken by the girls to clean our surroundings.To keep our environment greener and cleaner. 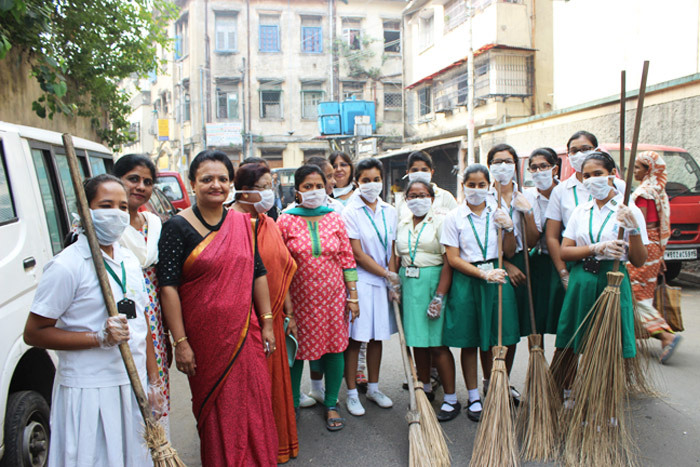 The place outside the school was cleaned by some of the girls of class 9 and 11. The LTS animators of the school also took part in this event to make it a success. This was an initiative taken to create awareness among all the masses to promote the habit of cleaning our environment and to keep it clean. The girls of Loreto Day School Elliot Road had gone to Rotary Sadan Kolkata, for a competition organized by the ‘Dignity Foundation’ on the 1st October 2015. The same day is celebrated as ‘grand parents day’, and their importance. The name of the skit played by the girls is ‘Dada ji ki lathi’ The skit was practiced several times and at last it came to a grand success. Everybody appreciated their performance. Many people were present there amongst them was a famous director of Bengali film industry named ‘Alokananda’. This event summed up to a grand success. The girls are really thankful to Sr.Nirmala, Mrs. Daniyal , Mrs. R. Ghosh for giving them an opportunity to show their talents. Some captains also helped them and trained them along with Mrs.R.Ghosh. The girl of 7(1) and 7(2) performed the skit. Mrs.R.Ghosh accompanied the girl to the Rotary Sadan. At the end the participants were awarded by a trophy. Mrs.R.Ghosh was called upon the stage to receive the trophy. The chief Executive of this event was Sweta Biswas of Loreto Day School, Elliot Road. Many schools participated in this event for three days in July, 2015. Our motive in this event was to plant trees and increase greenery in our environment. We were successful in planting more then 500 sapplings in girin Banerjee Park near hind cinema. It was a great experience for us as we were successful in making our environment greener. Independence Day was celebrated on 14th August, 2015 in the junior school hall. The LTsers from class IX – XII had taken the initiative to present the program. The program began with a prayer service followed by a PPT on the – diversity of Indian culture and traditions. There was an enactment presented by the girls of class IX. There was also a PPT on the problems faced by Indian. The program ended with sister’s speech. Teachers responsible were Mrs.S.Saha, Mrs. Ghosh and Mrs. Saniyal. On 8th August, 2015 the YCS members of Loreto Day School, Elliot Road had gone on a visit to “Mother House”. The catholic girls of classes IX & X had participated in this event. Our teacher, Mrs.A.Rocha had accompanied us. We prepared a short prayer service. The prayers and the gospel passage was given to us by our President and Vice President of the cell. A few petitions were read keeping the intentions of the group in mind, especially the half yearly exams which are round the corner. The program of praying at the tomb ended with the recitation of the rosary. This was offered for the well-being of the Principal, staff and students. Teen Ductus was organized by the LTSers. It was held on the 12th of July,2015 at shri shikshayatan college. The LTSers from various school like St.Xaviers collegiate school, Loreto House and many more participated in this event. The students were divided into several parliamentaries including Law & Justice, Finance, Defence, Medical, Home Affairs and many more. There were official people who guided us and gave us information about the various parliamentaries for our future need. This was followed by the presentations organized by the students of different parliamentaries. It was a great opportunity for us as well as for the non- LTSers.